Wunmi Fani inherited every sarcastic bone in her parents’ bodies and channels the genetic feistiness through her fiction stories. She’s always eating chocolate and plans to never stop laughing while she can. She hopes you never stop laughing too. When she’s not dreaming of her next writing project, she’s dreaming of her next beach bum vacation. 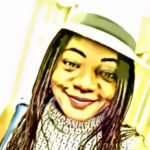 You can find out more about her and sign up for updates, free samples, and musings at wunmifani.thewriterentrepreneur.com.